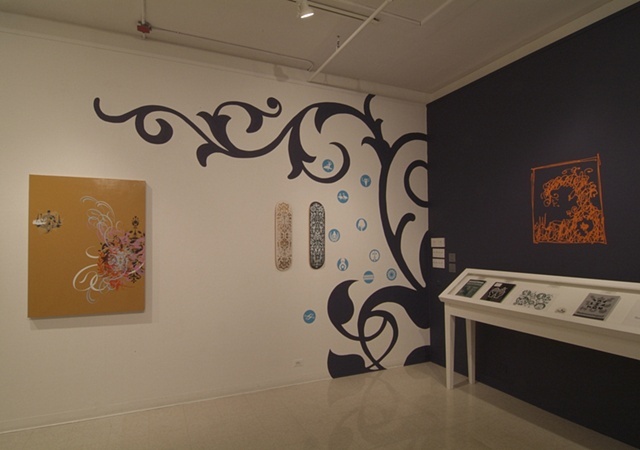 The exhibition featured several painted murals augmented by vinyl decals designed specifically for this gallery space. 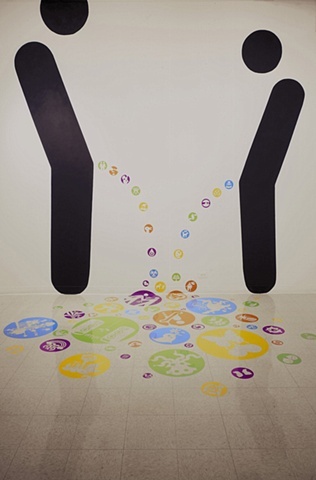 In addition, newly created large-scale paintings, screenprints and works on paper will also be shown. 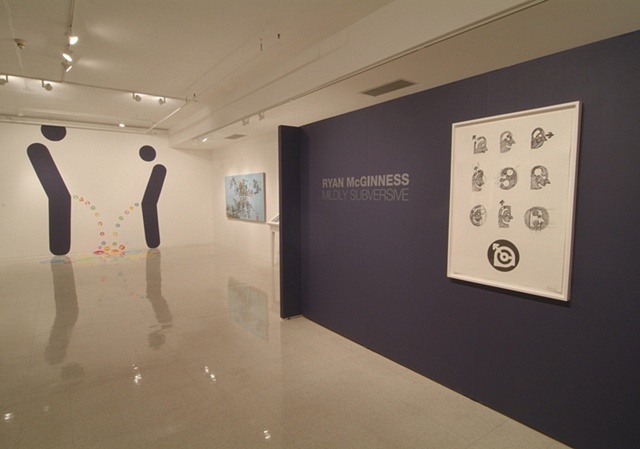 McGinness is best known for combining his background in graphic design with his fine art practice to form an innovative approach to contemporary art making. The resulting new and ornate visual language bridges the gap between pop culture and ‘high’ art. 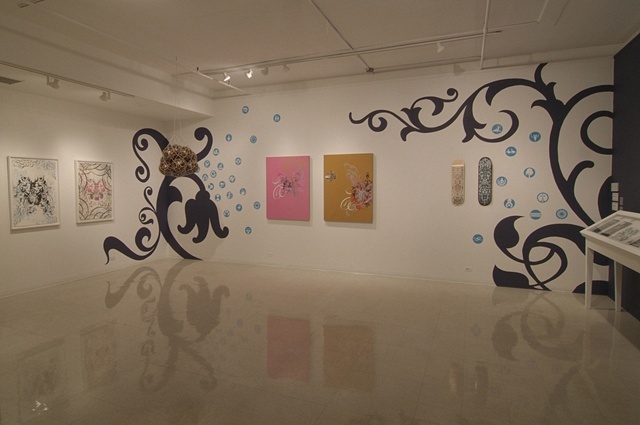 Referencing Hip-hop, graffiti and street culture, McGinness’ sensibility is distinctly urban. Effortlessly merging fine art, design, marketing and mass-production, McGinness’ creations quickly seduce the viewer into his world. Although all of McGinness’ pieces exist in digital form, the final product and most of his processes do not. Each emblem begins with hand-drawn sketches that gradually become more refined drawings that are then digitized to become vector drawings. McGinness edits these digital forms down to their bare essentials to prepare them for transfer to various surfaces, including canvas, paper, and gallery walls. 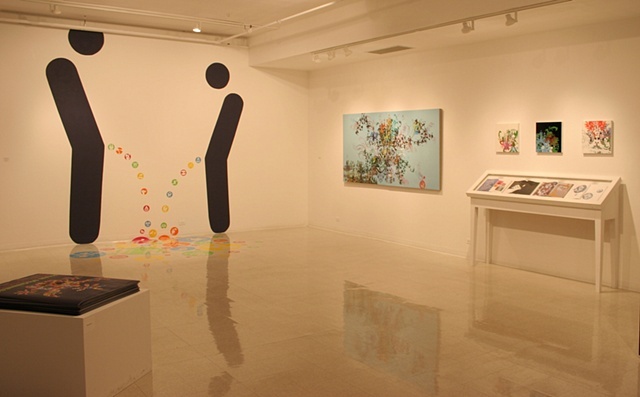 Fluidly moving his ideas between mediums, his corporate-like icons can also be found on limited-edition commercial products such as t-shirts, skateboards, and soccer balls. In sharp contrast to his bare-bone icons are his intricate paintings and murals, built up through layers of paint, sometimes followed by vinyl, to form complex compositions. Saturated with bright shiny colors, lines and forms, the final results are dramatic graphic statements that appear simultaneously familiar and fresh. Despite the slick look and feel of his surfaces, McGinness applies all of his screenprints by hand, purposefully leaving imperfections to show, as it is important to the artist that the human touch remains visible.